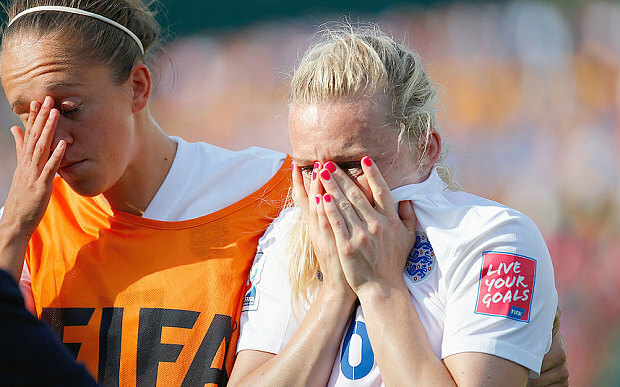 Laura Bassett’s tearful response to her own goal may resemble Paul Gascoigne’s emotional reaction to his yellow card against Germany in 1990. However, this campaign has not ended on the same low as it did 25 years ago. Ever since the crowing moments of English men’s football in 1966, the national side has been overwhelmed with pressure and attention every four years. The FA have churned through so many of the country’s most promising managers, to the point where no sensible Englishman would take the job. In turn the FA compensated for that by blowing nearly £5 million to maintain interest in the job from managers with respectable records. That is what makes this tournament so ground breaking for women’s football in England. Steph Houghton’s team were given 20/1 odds to win the tournament, ranked 8th overall by Odds Shark online betting, with little or no expectation to reach the semi finals. In defeating Norway and Canada they have overcome the challenge of a former world champion, and the hosts-who were ranked one place above England. But the importance of this team lies much deeper than in mere results. This England side is a team whose collective will to succeed has been forged through extreme personal hardship. Fran William goal against Colombia put her on par with David Beckham by scoring in three world cups. But while her male counterpart has become a global media icon, Williams has dealt with homelessness for seven years of her football career. Both Katie Chapman and Casey Storey have had to balance the demands of professional football with motherhood. Above all else they have had to deal with the constant challenge of playing the game they love against a backdrop of patronising gender stereotypes and a chronic gap in funding with the men’s game. Will this world cup change the under-appreciation of women’s football overnight? Of course not – but at least least the leap of faith has found solid ground. The semi final fixture against Japan received viewing figures of 1.6 million in Britain alone, despite the fact that the game was broadcast until after midnight. The unfortunate error by Bassett has provoked a wave of sympathy on social media, with the public beginning to gain some inspiration from the England women’s struggle. It is nice to hear of an England exit which provides more hope than despair.